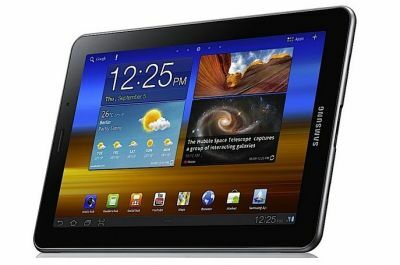 The Galaxy Tab 7.7 is the world's first tablet with an OLED display, a 7.7" Super AMOLED Plus panel, offering 1280x800 resolution. Other specs include Android v3.2, Dual-core 1.4Ghz processor, HSPA+ radio, 16GB to 64GB internal storage and a microSD slot, Wi-Fi, GPS and two cameras (3MP and 2MP). Amazon.com is now offering the Tab 7.7 for $555. This is an unlocked international model.